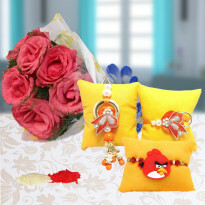 Celebrate this raksha bandhan with exciting rakhi gifts offered by Winni. 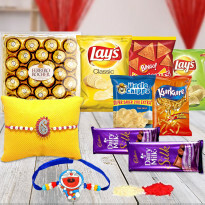 You can get wide collection of gifts to choose for your siblings online, like chocolate bouquet, rakhi with cake, rakhi with flowers, dry fruits, etc. We always deliver promises made to our customers through speedy and reliable delivery. So, order online now and send rakhi with amazing collection of gifts to your brother or sister to fill their day with joy and happiness. The relationship between a brother and a sister is simply amazing and it is beyond words to describe. The bond between siblings is incredible which is loaded with childish fights, love, jealousy, laughter and care. However, when talking about India, the relationship becomes more meaningful as there is a divine festival named "Raksha Bandhan " associated with it. Raksha Bandhan is purely dedicated to the siblings love. It is also popularly known as Rakhi festival. It is a celebration of love and affection that binds brothers and sisters together. The celebration takes place on the full moon day of the Hindu month of Sharavan. Sisters tie a holy thread called "Rakhi" on the wrist of their brothers and pray for longevity and prosperity. This ritual strengthens the bond of love that prevails between siblings. Brothers in return confess their love with a promise to protect their sister from negativities for lifetime. Apart from this, gifts are also exchanged between brothers and sisters. We at Winni, always endeavor to heighten our customers celebration by providing them a wide assortment of online rakhi gifts. If you are seeking for online Rakhi gifts online then Winni is the right platform that provides you a variety to choose from. So, celebrate this beautiful bond of brother and sister in a unique way with Winni's gift. We are united to numerous relationships the moment we are born. The time when we acquainted in this beautiful world, various other relations like mother, sister, father, brother and others get attached to us. Out of all these relations, the brother-sister relationship is acknowledged as a divine relationship. The bond of brother-sister is named as "Sibling" and to pay tribute to this bond, "Raksha Bandhan" is commemorated all over India including other countries. The rakhi celebration takes place with great spirits. To strengthen the sibling bond, a rakhi gift plays a crucial role. 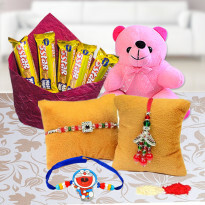 So, send rakhi gift to your sibling and heighten the joy of rakhi celebration with our commendable gifts. This spiritual festival was born on the divine land of India, which has been the part of Indian tradition since ages. One of the most popular Indian mythology legends is “Krishna” and “Draupadi”. Krishna cut his little finger and Draupadi tied a piece of cloth on his finger. In return, he promised to protect her in worst times. Another popular tale is of “Rani Karnavati” and “Emperor Humayun”. Rani Karnavati sent a letter with a rakhi to emperor Humayun asking for his help and to protect her against the invasion by the Sultan of Gujarat, Bahadur Shah. There are many other Raksha Bandhan fables that hold special space in Hindu culture. However, every story illustrates the beautiful bonding that prevails between brothers and sisters. Raksha Bandhan depicts the association based on protection. It has a long-standing in Indian heritage that depicts the divine love that exists between siblings. Different religions have the different significance for this festival. Hinduism: This sacred festival is mostly celebrated in northern and western parts of India by Hindus. The festival of Rakhi is observed as an emblem of love between siblings. It is purely meant to commemorate any kind of brother-sister relationship who may not be biologically related. It is also celebrated between siblings belonging to distant relatives or cousins. Some other countries who also celebrate this occasion are Nepal, Pakistan and Mauritius. Sikhism: The occasion is purely dedicated to the brother-sister love and it is named 'Rakhari'. Jainism: Jain Community also cherishes this festival with great enthusiasm. Jain priests give ceremonial threads to the disciples. In Jainism, the festival manifest self-protection against physical violence. Rakhi with Sweets: Rakhi- the thread of love when coupled with sweets, makes a beautiful pair. You can order and send this combo to express your gratitude towards your brother. The beautiful rakhi thread will beautify his wrist and the luscious sweets will gratify his taste buds. Rakhi with Flowers: With the passage of time, the relationship between brother and sister get strengthen just like a bud develops into blooming flowers. This Rakhi festival, make this bond stronger by gifting your brother a delightful combination of rakhi and flowers. Let the flowers spread the essence of joviality in your relationship. Rakhi will bring longevity to your brother's life as well as in your relationship. Rakhi with Cake: Rakhi along with cake is a unique combination that illustrates a tempting celebration. 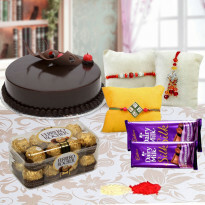 Convey your heart-melting love to your brother by gifting him a killer combination of rakhi and cake. Drool his taste buds with our yummylicious cakes and add pearls to his wrist with our beautiful rakhis. Rakhi with Chocolates: Not only girls but boys too crave for chocolates. 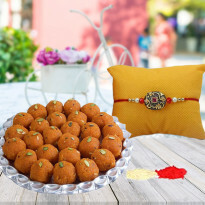 If you have a younger brother who is very naughty and loves to eat chocolate then rakhi with Chocolate is the perfect gift for rakhi festival. 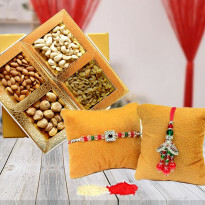 Rakhi with cake, flowers, dry fruits, sweets and chocolates: This is a grand combo that will force your brother to jump in joy once he will receive this gift from you. 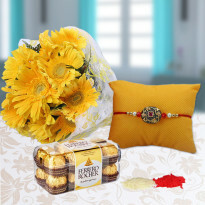 Rejoice the aura of rakhi celebration by sending this grand combo to your brother. The rakhi thread plays a pristine role in the Raksha Bandhan festival. There are the different type of rakhi threads available and each thread has their own specialty. Winni has emerged with a wide collection of online rakhi for Raksha Bandhan 2018 out of which you can select according to your choice. You can order and send rakhi online in India from Winni as per your desire and wish him Happy Raksha Bandhan 2018. Simple Rakhi: The divine thread of love exudes a pure love between brother and sister. A simple rakhi, when tied on the wrist of your brother, will develop a strong bond between you and your brother forever. You can send this rakhi online to your brother from anywhere in India. Designer Rakhi: Designer Rakhi would be the perfect choice for sisters who are seeking for something more elegant. These rakhis will give an attractive appearance on the wrist of your dearest brother and intensify its elegance. Pearl Rakhi: Pearl rakhi are commonly embellished with captivating pearls. The pearls adorned in rakhi may vary according to the design of the rakhi. These rakhis will surely beautify the wrist of your brother with its attractive appearance. Sandalwood Rakhi: Sandalwood rakhi usually looks indigenous and dramatic. These rakhis come in different shapes and sizes. They are commonly known as 'Chandan Rakhi'. This rakhi when tied on the hand of your brother then it will give him pleasure with its aroma. Swastik Rakhi: This rakhi is quite famous amongst young boys. You can tie this beautiful rakhi on the wrist of your brother and pray for his longevity and well-being. Kids Rakhi: If you have a little brother and you want to delight him in a unique way then buy kids rakhi online and win his heart. Our kid's rakhi collection includes doreamon, chota bheem, Ben 10, minion, emoticons and many more. Lumba Rakhi: The celebration of Rakhi has become more interesting. Now, you can also tie rakhi to your sister-in-law. If you adore your sister-in-law just like your brother and you want to develop a beautiful bond with both of them for the entire life, then send Lumba rakhi online as an expression of love and prosperity on Rakhi festival. Winni has specially introduced Lumba Rakhi for Raksha Bandhan 2018. Set of Rakhi: You can also buy a set of rakhis which are available in a set of 2, 3, 4 and 5. Send rakhi online in pairs to your brothers, brother-sister-in-law, twin brothers and cousins and let them know that you truly love and care for them. Metal Rakhi: Metal rakhi is one of the most trending rakhis. You can order and send rakhi online for your loving brother who is far away from you. Mauli Rakhi: Mauli rakhi is a sacred thread which is tied during religious rituals on the wrist of people. You can order this and send rakhi online to your brother on Raksha Bandhan to represent your pious love. The bond between brother and sister can be further heightened with the exchange of impeccable Rakhi gifts. Brothers always love their sisters and pamper them like a princess. 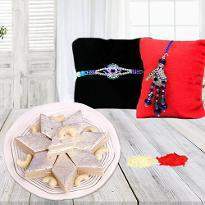 This rakhi festival, delight your sister in a stylish way by presenting a wonderful rakhi return gift. You can also flip through our extensive range of online Rakhi gifts for sister to select an extremely beautiful return gift to exhilarate your charming sisters. 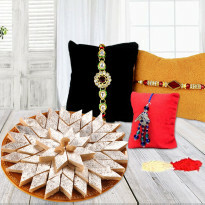 You will find abundant rakhi gift ideas for your sister. Everything starting from personalized photo cake to enticing chocolates, teddy bear to salted treats and flower bouquets to chocolate bouquets will surely win the heart of your adorable sister and leave her with a million dollar smiles. For those guys, who are miles away from their sisters need not get disheartened, our online gift delivery in India will brighten her day and convey your love that you want for Raksha Bandhan 2018. 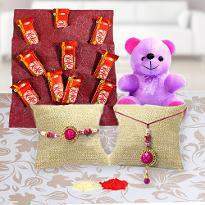 So, go ahead and place your order and send rakhi gifts to India with online rakhi delivery service. Raksha Bandhan is the most awaited festival that was originated in the northern and western regions of India. However, it is celebrated and enjoyed throughout India with the same spirit and zeal. The festival has also reached beyond the geographical edges and is celebrated with the equivalent enthusiasm across borders as well. With the ease of online rakhi stores, you can easily send rakhi gifts online to your siblings and commemorate the bond with the equal warmth regardless of the geographical distances. To celebrate the essence of siblinghood, Winni presents online rakhi gifts for brothers, sisters, cousin brothers and sister-in-law. Now, you can easily express your deepest emotions by sending online rakhi gifts to your brother with our online rakhi delivery service in India. You can conveniently buy rakhi online for your brother from here. Along with rakhi, you can also discover rakhi gift ideas for your beloved brother to celebrate Raksha Bandhan 2018. 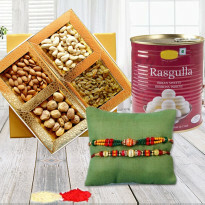 Ranging from delectable cakes to greeting cards, traditional sweets to divine bamboo plant and chocolates to Ferrero Rochers, we have a huge collection of Raksha Bandhan gifts ideas for brothers, out of which you can grab the one according to your desire and send using online rakhi delivery option. Winni: One Stop Destination for Online Rakhi Shopping| Order and Send Rakhi Online Now! 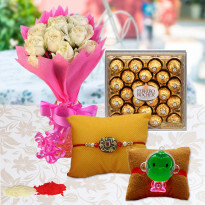 Our rakhi online shopping store assists you in choosing the best rakhi for your brother or sister in law. Here, you can find a plethora of rakhi collection and can choose the one which will glorify the wrist of your brother and sister-in-law. Ranging from simple rakhi to designer rakhi, bhaiya rakhi to bhabhi rakhi, single rakhi to double rakhi and kids rakhi to mauli rakhi, Our rakhi online shopping store has a huge range of rakhi collections, so you can order the one which you desire and send for express delivery in India. The spirit of the Rakhi festival lies in the heart and soul of siblings. This Raksha Bandhan 2018 occasion, fill the day of your siblings by surprising them with delicious treats. At Winni online rakhi store, where celebrations hold a great significance, Raksha Bandhan is no distinct. 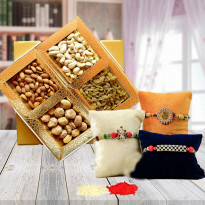 To celebrate it in a healthy style, Winni offers rakhi with dry fruits. 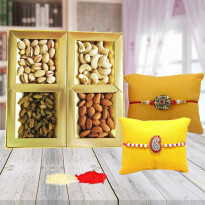 The pairing of dry fruits along with rakhi gifts makes a healthier combination which suits for brothers as well as sisters. Send your Rakhi wishes in the form of gifts and amaze your brother in a trendy way. 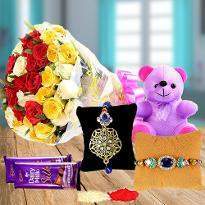 Brothers can also send this gift hamper from our rakhi online shopping store as a return gift to express their love to their sisters. Greeting cards perhaps the traditional way to greet your brother 'Happy Raksha Bandhan 2018'. If you are looking for beautiful Raksha Bandhan greetings for brother then you are at right online rakhi store. Make this traditional ritual a modern celebration by presenting greeting card along with cake,flowers and rakhi. Your brother will be overwhelmed after receiving such a stupendous gift from you. The act of presenting a gift exudes a number of emotions. It is indeed the best token of wishes and blessings that proved to be the excellent way to delight anyone. Ordering and sending gifts is an impeccable way to heighten the bond with loved ones. Rakhi is an occasion in which siblings wish 'Happy Raksha Bandhan' to each other by exchanging gifts. Perhaps, rakhi gift ideas work wonders. But what you will do if your sister or brother lives in India and you are in abroad? No worries, still you can send your rakhi wishes wrapped in gifts and can mark your presence on the divine occasion of Raksha Bandhan. 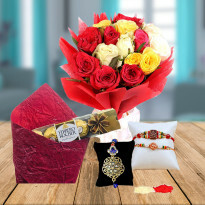 Midnight online rakhi delivery and rakhi gift delivery are another way to send your wishes and blessings to your brother who is far away from you. Surprise your brother at the stroke of 12 and let him know that whether it's night or day or a huge geographical distance, nothing can stop you telling him that he means a world to you. A midnight rakhi gift will leave a positive impact on the soul of your lovable brother. The love between brother and sister is immeasurable. The bond of brother and sister is full of love, fights, jealousy and respect. Rakhi is the festival which is officially recognized to celebrate this beautiful bond. If you are away from your beloved brother in USA and desperately missing him on the auspicious occasion of Rakhi, now no more grieving. Winni provides you an opportunity to send rakhi to India from USA , UK, Australia and many other countries Nowadays, distances are no longer the reason not to celebrate occasions with enthusiasm. 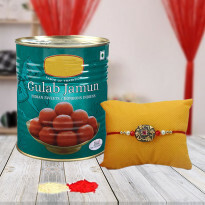 Online portals have truly graced the art of gifting and amongst all, Winni is the best online brand who provides the best opportunity to send rakhi to India to impress every brother. 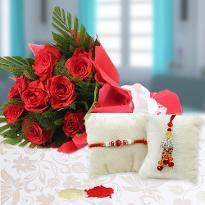 Online rakhi delivery service is proven to be worthy when it’s talking about impeccable services. 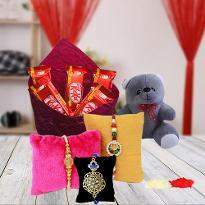 Celebrate Rakhi festival with full fervor.. Winni has made the online shopping of Rakhi easier for you. If your brother lives away from you, still you can make him feel special by sending Rakhi online from Winni. Don’t let the distance spoil your celebration. Winni is the optimal choice for you as we give more stress to keep you close to your siblings. 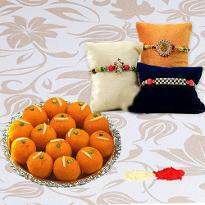 We cover the largest geographical area and offers you smooth Online Rakhi delivery in India. Send your brother or sister a token of love and hearty greetings of Raksha Bandhan with our special Rakhi combos made for you. You can send Rakhi gifts to your brother or sister anywhere in India. 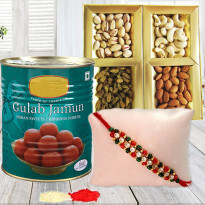 We deliver Rakhi gifts almost all the major cities of India like Bangalore, Noida, Delhi, Hyderabad, Kolkata, Jaipur, Chennai, Ahmedabad, Mumbai, Chandigarh, Amritsar and much more. The festival of Raksha Bandhan is not just confined to India, it also has its effect across different other countries wherever Indians have settled. Don’t worry if you live in abroad, our online rakhi delivery service will make you feel close to your lovely brother and sister. 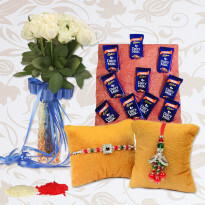 Sisters can send rakhis online in India and brothers too can send rakhi gifts for sister . Our dedicated team do their best so that no moment of the celebrations can go tarnished. To make the ordering process easier, we also have the option of different cities, so that you can easily make an order with just a mouse click. Our team delivers the happiness at your home to make the celebration more special . So, order rakhi gifts online and take your rakhi celebration to a new level. Basically, we are sending a box of happiness to celebrate this joyful bond called siblinghood. 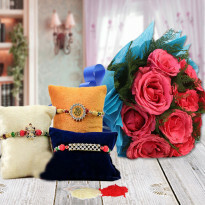 Spread the smile to the faces of your lovely siblings just by placing the order of right rakhi gift. 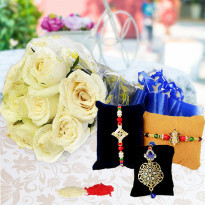 Make this beautiful occasion of Raksha Bandhan overwhelming by uplifting the soul of your loved ones with a precious Rakhi gift showcasing the strong relationship between brother and sister. Just browse through our lovely Rakhi collection and with our fast and convenient online rakhi delivery service, send Rakhis online in India. The main motive of the rakhi is to spread love and care between brother and sister. On Raksha Bandhan, tying rakhi on the wrist is not only the simple thread, this means a lot. Rakhi defines the trust, belief, protection and care with love from the sisters to their brothers. In India, Raksha Bandhan is celebrated with different ways and tradition in various states. Nowadays, people celebrate this day in modern style. They choose the option of rakhi online shopping . Sisters buy rakhi online for their brothers on this occasion to express their love and care towards their brother. All the festivals are incomplete without sweets like chocolates, cakes and other food items. Sisters always try to go individually to meet brothers and celebrate Raksha Bandhan. But sometimes they are not reachable or distance is more, at that time they have the only online option to send rakhi, sweets and gifts. If you come amongst them then you can easily go for online option to choose online gifts to express your existence on this special day. Winni is a renowned online gift portal who provides amazing gifts for every occasion and celebration. 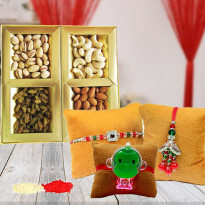 And when it comes to Rakhi festival, then truly Winni has bagged the title of the best online gift platform from where you can send rakhi online to your brother from any part of the world. Apart from rakhi, you can also send rakhi gifts to your brother. Our seamless online rakhi delivery services will add more amusement in your relationship. We are proudly focusing on our motto "Winni-Celebrate Relations" and we have achieved so far so good. We have 1,000,000 satisfied customers. We ensure to deliver you gifts on-time for every occasion. So, go ahead and place your order and send rakhi gifts to your brother now!